Microsatellites are areas of the genome composed of mononucleotide (e.g., AAAAA) or dinucleotide (e.g., CGCGCGCG) repeats. Errors in DNA replication are more likely to occur in microsatellites during cell division. Because of the repeated sequences, the new and template DNA strands may become misaligned during DNA replication, leading to replication machinery slippage that results in too many or too few repeats in the microsatellite. The term microsatellite instability describes the resulting incorrect number of microsatellite repeats. People with Lynch Syndrome are more likely to have tumors with microsatellite instability because the loss of mismatch repair gene function prevents the correction of errors that occur during DNA replication. Approximately 90% of colon tumors from individuals with Lynch Syndrome demonstrate microsatellite instability, whereas only approximately 15% of sporadic colon tumors do. The National Cancer Institute recommends a panel of five microsatellites to evaluate for the possibility of Lynch Syndrome (for information, read this article: Cancer Res 1998;58(22):5248-57). Two of the markers (BAT25 and BAT26) are mononucleotide repeats, and three markers (D2S123, D5S346 and D17S250) are dinucleotide repeats. Generally, microsatellite instability in mononucleotide repeats is more typical in Lynch Syndrome-related tumors. 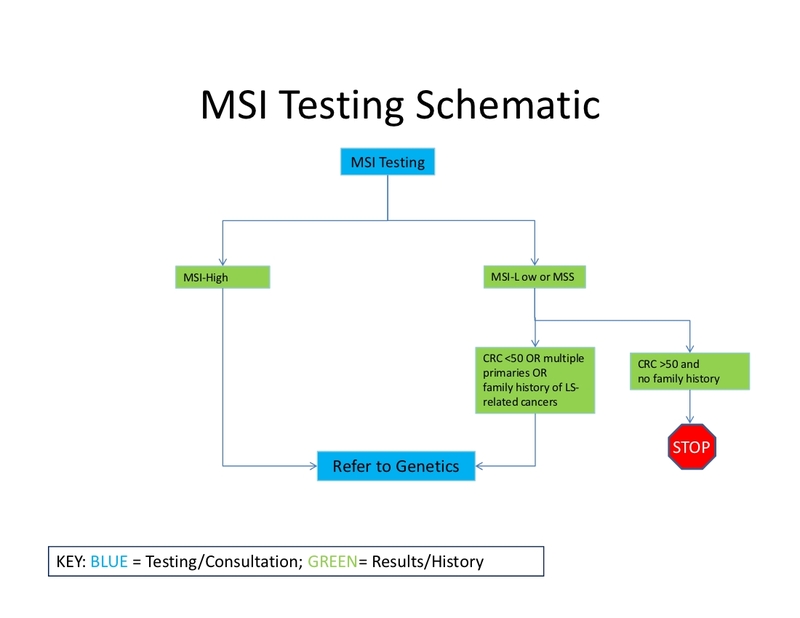 As a result, many laboratories now use an MSI test kit that includes five mononucleotide repeats instead of the originally approved panel. 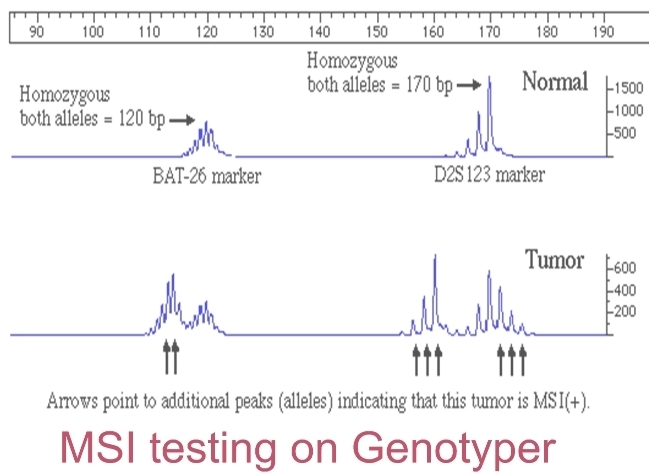 If microsatellite instability is only detected in dinucleotide repeats, testing of additional mononucleotide markers may be helpful (JNCI 2004;96(4):261-8). Individuals with Lynch Syndrome are most likely to have MSI-H tumors, although mutations in MSH6 sometimes result in MSI-L or MSS tumors.